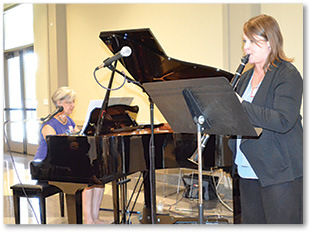 The floating sounds of piano and clarinet, medical information and words of inspiration synthesized into a concert-style presentation about music, healing and their doctor/patient relationship by Jan Grimes and Dr. Sarah Perez at the Women in Spirit meeting Aug. 27 at the St. Joseph Cathedral Parish Hall. Grimes, organist for St. John the Evangelist Church in Plaquemine and member of St. Joseph Cathedral, and Perez, who graduated with a degree in clarinet performance from LSU, share a love of music. Grimes accompanied Perez during her senior recital. Their paths would seem to part, as Perez discovered during her musical career that she had a love of people, which inspired her to go to LSU Medical School. She is a neurologist at Tulane Center for Neuroscience Sciences and divides her time between Tulane University and VA medical centers in New Orleans. Perez and Grimes would come full circle through the connecting thread of music and medicine. A musical family, Bill and Jan Grimes met at the University of Cincinnati College-Conservatory of Music. They later joined the faculty at LSU, where Jan taught for 30 years. Their son, Jonathan, is a production coordinator for the Arts Council of Baton Rouge and son, Tim, is scheduled to be ordained as a priest in May. After Jan Grimes was diagnosed with Parkinson’s Disease, her husband talked about the healing power of music at a music conference. Perez’ mother-in-law was in the audience and told Grimes that her daughter is a neurologist specializing in Parkinson’s Disease. It wasn’t long until their mutual love of music was rekindled, and now they perform together and speak about their relationship and music and healing. The duo, which calls themselves “Full Circle,” plays at Parkinson’s symposia and support groups around the region. At the Women in Spirit meeting Grimes played piano and Perez played clarinet, creating sweeping interludes between music and discussions. Grimes, who has performed more than 650 recitals and developed the program in collaborative piano, said she has found the silver lining in her disease. “For so many years, I was Jan the pianist,” said Grimes, who noted Parkinson’s helped her redefine who she was. She said she has had more time to get back to her old hobby of sewing, with samples of handbags she had made for women who cannot handle the traditional purse closures due to arthritis or other disabling conditions. She has given away numerous handbags. She has also had time to garden and create charcoal drawings. She has even hosted an in-home day camp for seven neighborhood children and taught them cooking and sewing. A positive attitude is critical in dealing with diseases such as Parkinson’s, according to Grimes. She keeps up with her daily chores around the house, exercise and piano practice and meets with a group of three women who support each other and talk about their latest symptoms. She and Perez said they try to time performances when Grimes can be at her peak. Grimes’ talk, in fact, was upbeat about the things she has gained through Parkinson’s. She emphasized it is important that people with Parkinson’s read as much as they can about the disease and how it pertains to them or does not pertain to them at all. Perez answered several questions about Parkinson’s, and Grimes added her experiences with the disease. She also prefers the word “condition” rather than “disease” when talking about Parkinson’s, as disease implies that someone should be isolated during medical care. Support from family and friends is critical in managing Parkinson’s well, according to Grimes. If one is having a bad day, they can engage in something they love, reach out to someone who is willing to listen or engage in a spiritual activity. Grimes believes coming full circle with Perez is God’s way of saying, “I’m not finished with the two of you.” And it is through Perez that she is kept up to date on the latest developments in Parkinson’s and receives spiritual support. “The most wonderful thing was when God reminded me of his ever-present care and love by reuniting me with Dr. Sarah Perez,” said Grimes.